I added some pictures today. This blog is not as user friendly as I would like for it to be. I am sure once I get accustomed to it’s “inner workings” it will be no problem. The program just doesn’t think the way I do. I posted a picture I took of myself with my self timer. Fortunately, my photo software was able to sharpen the image because I haven’t figured out how to tell my camera how to focus before the 10 seconds are up. You will also see a picture of me with the kids on their first day of school last week. It was Wednesday, August 13, 2008. We treated them to a donut breakfast before taking them all to school. They were so excited to wear their new school clothes and see their friends. A did not even give me a hug. She just sat down where she was supposed to & with a huge grin on her face. I was so shocked & surprised that I just talked with some of the other moms, waved to her and I was out the door. I thought, “that was easy!” You have to understand last year at pre-k she would hug on my leg & beg me not to leave. The teachers would have to pry her away from me as she cried her eyes out. I remember when K went to Kindergarten. 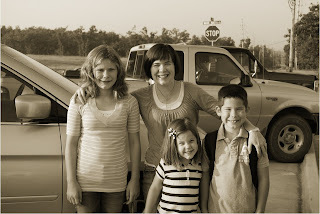 I had to choke back the tears as I saw my first born begin her school years. If it were not for having a very long summer, with not much time to myself, I might have found myself doing the same thing since A is our last. After I dropped the kids off to school I went to the floor store to look around & get some ideas of prices. I then rushed home to read more of Breaking Dawn. Hubby & I had a nice quiet lunch at a local Chinese restaurant, checked out progress on new home and did some grocery shopping before picking the kids up from school. All kids agreed it was a successful first day of 8th grade, 4th grade and Kindergarten! 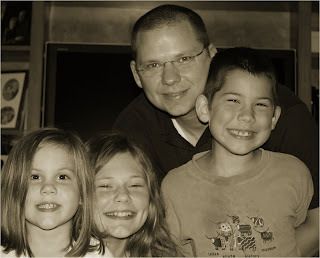 The next photo is of Dad & kids. Every year right before school hubby gives the kids a Father’s Blessing. This is a special prayer for each child. We did this during our Family Home Evening on Monday, August 11, 2008. The kids are so still & quiet…reverent as the prayers are given and you can feel the sweet spirit of the Holy Ghost. It is a great way to start off the school year! Today I met with the builder at our home site & spoke to the city engineer about our drainage issues. The development does not have sewer or curbs. Therefore we will have to bury a huge drainage pipe to drain the water. Anyway, I witnessed the framing crew putting up the tallest peak of our home. 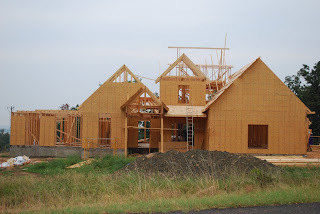 It is a miracle to see how they have built our home. We go almost every day so I have seen it go up little by little; but I still just marvel as I look at it. I feel blessed beyond measure. I guess that is enough writing for today. Until next time…be grateful…it’s the secret to happiness! I read 4 books in a week in a half! My days of reading just non-fiction are over!…Thanks to Stephenie Meyer and her “Twilight Saga.” I have never felt this way about a book or books before. To be honest, I probably have only read one or two fiction books in the last 20 years from cover to cover. It’s an ADD thing, ya know. All I can say is that I am thankful my friends persuaded me into reading Twilight. I bought it on August 1st and finished it on August 5th (498 pages!). I was hooked! The next day I bought the other 3 books (just as many pages or more) and spent all my spare time reading. My kids were shocked to see their mom reading a book besides the scriptures…especially a fiction book. They could not believe how fast I went through them & asked me questions about the book constantly. I was happy to oblige whenever I was not reading since I wanted to think & talk about it all the time. These characters were constantly on my mind. I have always been a movie girl. Reading has never been a passion of mine, those of you who know me, know this. But I have never thought about a movie or characters in a movie as I have with these books. I am actually considering reading them again because I don’t want to leave this make believe world. Yes, that is how great they are! I can not wait for the movie to come out this fall. It will be released on November 21st! I am hoping that each book will be made into a movie. If the movie is anything like the book, I will totally love it! Thanks Stephenie Meyer for giving me something awesome to read after my kids go to bed!